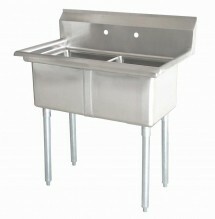 Find the perfect sink for your commercial kitchen, by browsing our large selection of commercial pot washing sinks! 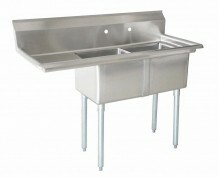 2 tub commercial sinks are available with a left or right drain board (or both!) depending on your establishment’s unique needs and functionality. The 2 tub commercial pot-washing sink is the perfect first-step to creating a productive and efficient commercial kitchen atmosphere! Available in 1, 2, or 3 tubs, we carry the highest quality stainless steel, perfect for either a fast rinse or an overnight soak. With our 2 or 3 compartment sinks, you are able to dedicate each tub to a separate task! This increases efficiency and limits the amount of time spent on hard-to-clean pots and pans. 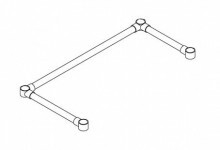 Perfect for various sized bakeries, delis, grocery stores, butcher shops and restaurants! 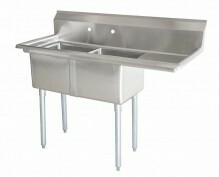 Available in various sizes and depths, these stainless steel commercial pot washing sinks are durable and long lasting, with accessible storage space underneath. The two-tub commercial kitchen sinks are perfect for high production kitchens, as they have the space to hold a larger number of pots and pans!